Hello Windows lovers? How are you? Today I am gonna share how to copy a bootable Windows disk I mean how to back up a Windows CD/ DVD disk. Suppose you purchased a Windows from Microsoft costing $200 and it doesn't work anymore after installing Windows for few times. Is it fair? Not at all - let's punish Microsoft!! And of course a PC user with sufficient operating knowledge! And you should know, if you simply copy a Windows disk and burn it to another blank disk, then you will get something on that disk. But it will not be usable. Even if you're able to start installing Windows from running condition, it will be stopped installing after reboot. That means your disk will not be bootable. And you will not be able to set up Windows from a non bootable disk. So you have to create a data disk which will be bootable. Hope you got my point. Here, for the purpose of this tutorial, I'm gonna use Windows 8 Pro and Infra Recorder as burning software. So I will use the word Windows 8 and Infra Recorder evrywhere. But it applies for other versions of Windows too. You can also use Nero. But always remember, whatever you do, you have to create a data disk. Go to the Menu bar > Actions > Copy Disk > To a Disk Image . . .
Now select your source file I mean the Windows 8 Disk location. Normally it detects your drive automatically. Now manually choose the destination of your Windows Image file (ISO file), name it as Windows 8.iso and hit OK. Now copying will be started. Wait for the task to be finished. It may take few minutes. After completing the task, Windows disk will be ejected automatically. And you will get an iso image of your Windows. Now insert a blank DVD in the drive. The size of a single layer DVD is usually 4.7 GB. Try to use a good disk. Otherwise it will not be durable. Go to the Infra Recorder again and choose Burn Image from Actions menu. 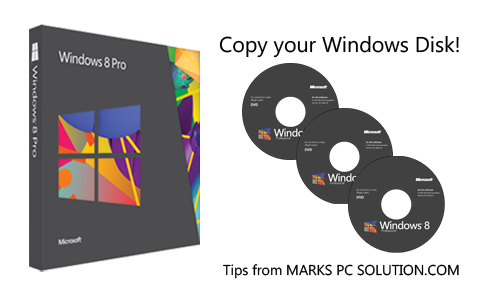 Locate Windows 8.iso from your hard disk and open it. Choose the drive which contains blank DVD and hit OK. And the burning process will be started immediately. You can also burn through Windows 8. No third party software is needed. If you have previously saved copy of a Windows iso image then you don't need Nero or Infra Recorder. 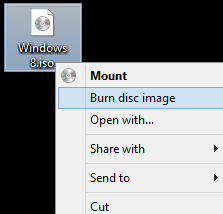 Simply click right mouse button over the Windows.iso file and choose Burn Disk Image. Choose your DVD drive and start burning! Make sure that your master disk is okay and free of scratches. Before inserting the disk to the drive, gently clean it with a soft tissue paper. Any interruption in the power supply during this operation is not acceptable. If you face any problem, please inform me. So if I download any ISO from internet, with this process I can burn right ?? can you please give me a good preactived windows 8.1 download link torrent ?